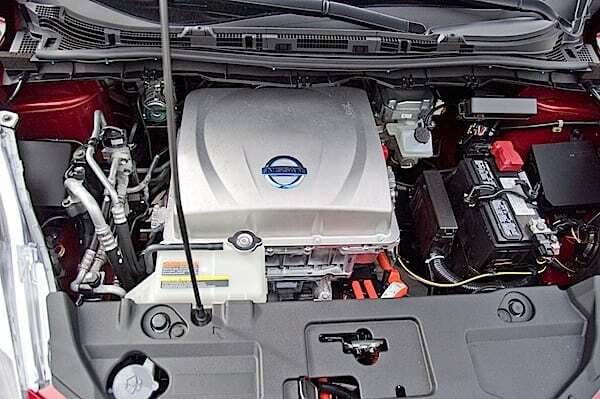 The 2014 Nissan LEAF SL improves on many fronts, including efficiency and handling. 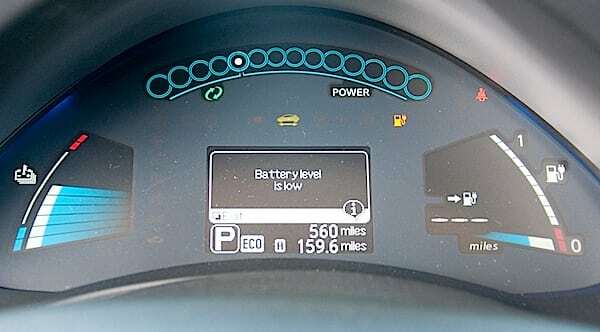 The second generation shows Nissan is maturing the LEAF very well. It makes us look forward to what’s next. We test drove the 2014 Nissan LEAF SL for seven days and walked away feeling that this is one of the most mature EVs available. We didn’t go easy on it, stressing its range and ourselves, by running the battery completely dry. Overall, this is simply a well-rounded EV and should be more than enough for anyone’s city driving and light highway travel. A friend of ours who owns one travel needs every day from Long Beach, CA to Santa Monica round trip without charging until back home. This is a daily trip of over 63 miles without feeling (the often over-abused) range anxiety. 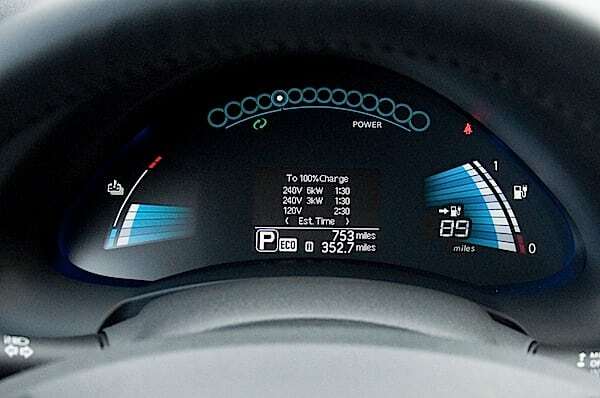 The 2014 Nissan LEAF SL shows how far the company has come with its LEAF. If the first generation left us feeling it was off to a good start, the handling wasn’t anything to “ride” home about. 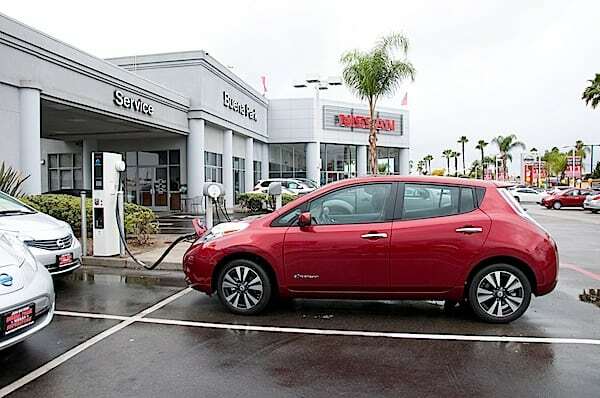 It is safe to say that the 2014 Nissan LEAF handles much better than the previous versions. It should convince most naysayers that EVs are worthy cars. The SL version manages something difficult to do: luxury and efficiency. Leather seats might be comfortable, but they are heavy. 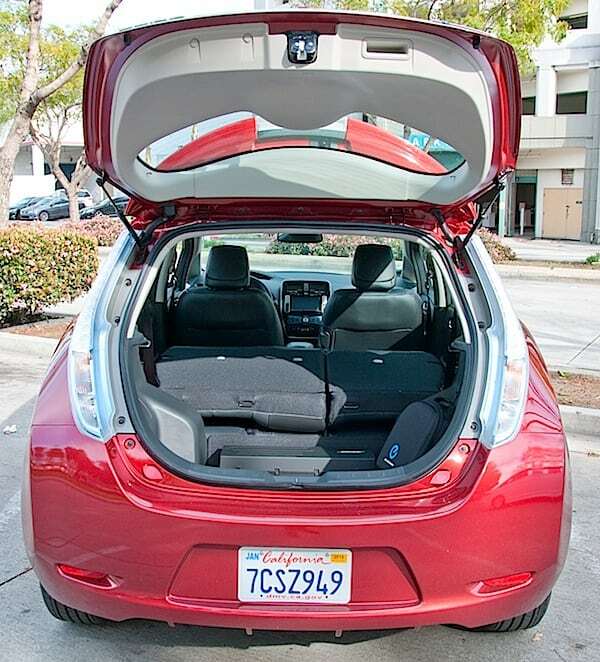 None the less, that weight doesn’t seem to penalize the overall efficiency of the LEAF. The seating position is good, although I found it to be a little high, but this won’t be a problem for people used to a high driving position. Ergonomically speaking, everything falls right where your hands are, from the well thought-out steering wheel buttons, to the drive knob, and the infotainment system display. On that particular one, we were pleased to see Nissan placed it so as to make it usable any time of day, even when the sun shines above it. This is something we haven’t always observed with other cars. 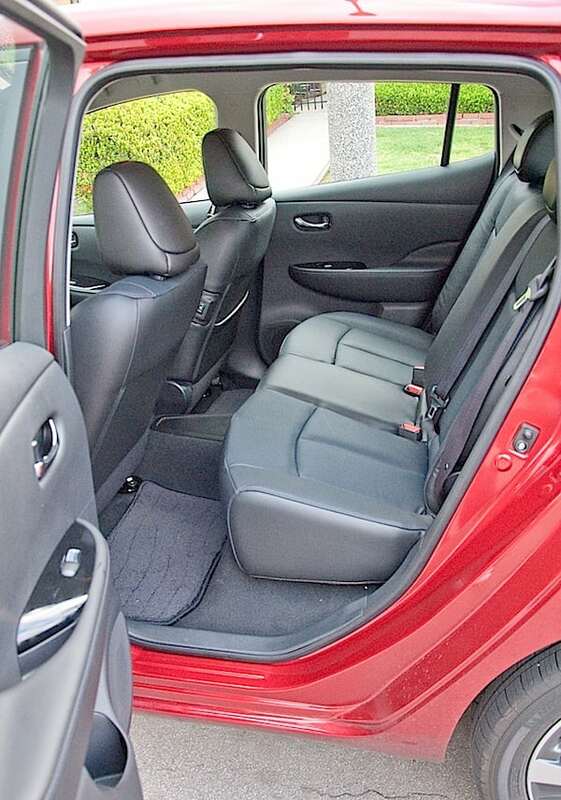 The car comfortably seats four, and five can fit in a pinch. Efficiency is probably the new LEAF’s second name. 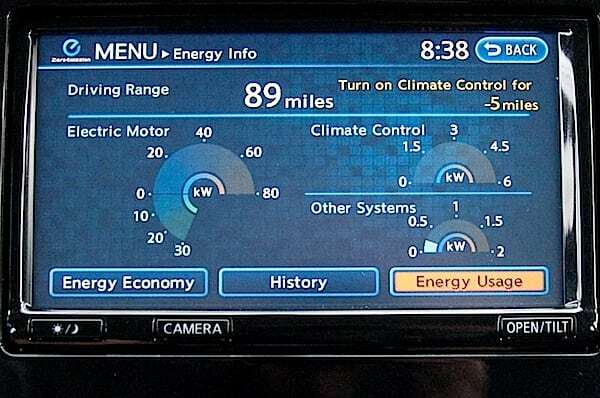 We were able to sustain a draw of 2 kW at 70 MPH, a testament to Nissan’s engineering and overall efficiency. 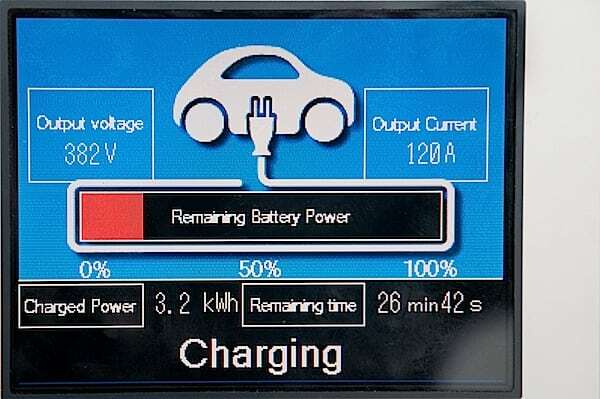 Once more creature comfort systems are used, such as the radio, ventilation and lights, the LEAF seemed to be happy with no more than .5 kW. Range anxiety? What range anxiety? We managed a long highway trip starting from Irvine, CA to Long Beach, about 27 miles, then Long Beach to LAX for another 20 miles, and LAX to Culver City for another 6 miles. We drove around Culver City for about 3 miles, then headed out to Mitsubishi’s Cypress Hills’ fast charger, a good 30 miles. We reached our final destination with a flat battery pack in ECO and B mode, and doing close to 55 MPH the last few miles. We drove a constant 70 MPH most of the time for this 86 mile trip, which shows you can squeeze a lot of range from the Nissan LEAF. The Nissan LEAF’s competition can be divided into those leased and those bought out-right for about the same price. Buy now EVs: Mitsubishi i MiEV, BMW i3, and the Ford Focus Electric. Lease only EVs: Honda Fit EV, Fiat 500e, Chevy Spark EV. More on the Spark EV test drive coming soon. Handling is something Nissan certainly improved with its new LEAF version. The car is well poised despite its energy efficient tires. In Eco mode, you will have enough oomph when flooring it, ideal for passing cars or getting on a highway and the normal mode won’t take you by surprise. 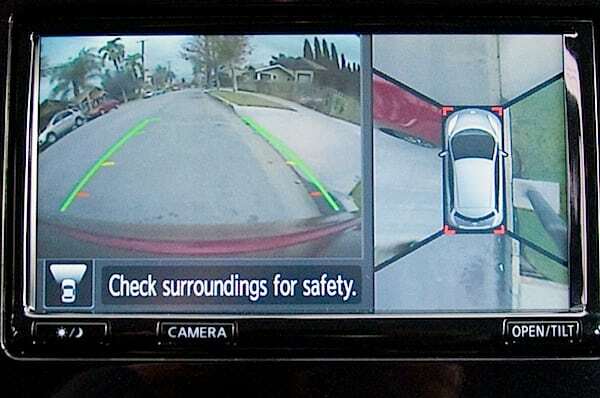 The infotainment system display’s angle makes it usable at any time of day. This is a major concern with most of cars we’ve had in the past. What we liked even more was the 360 degree view, as shown below. There is a blind spot looking back on the C pillar, something you can get used to. We felt the front seats are a little high, but in line with this day and age of SUVs and their pickup trucks usual seating position. As with most EVs the range estimation, leaves much to be desired. As long as you remember the rule of thumb that any highway driving will eat away a good 20 miles of the total estimate, you should be fine. The road map and direction estimation needs to take into consideration time of day and local traffic, which directly influences the results. On more than one occasion, we went looking for a fast charger and had to discard the highway route, or well known congested arteries. We would like to see real-time data to reflect the road traffic condition, as well as whether or not the fast chargers are in use. We once drove to a broken one, almost empty. We walked away feeling the Nissan LEAF is one of the most mature EV on the market today. It performs in a reliable way, without making you feel you are flying a spaceship or racing a car. Nissan certainly did a great job making sure anyone can drive the LEAF and feel at home. This, however might not please everyone, especially those looking for more fun and character. Still, that is the price to pay. You either get an efficient car that will take you the distance, or one that will leave you short of the destination. Test Period Length and Limitations. We had this car for 7 days, in mostly sunny conditions, with only two days of rain. We covered 450 mixed miles, highway and city.